I don’t think I’m alone in saying this, but as far as I’m concerned there is no better time for baking cookies than Christmas. At other times of the year I can be more likely found baking a cake or a batch of brownies; something that can be whipped together in one go, cookies seem so arduous somehow in their singularity. I make an exception at Christmas. Normally I bake traditional sugar cookies with my sister and grandmother. The cookie itself isn’t much to write home about but the ceremonial process of icing the cookies, dusting them with sprinkles and then wrapping them up in cellophane bags to give as gifts to family and friends is to me exceptionally pleasing and the epitome of the season. 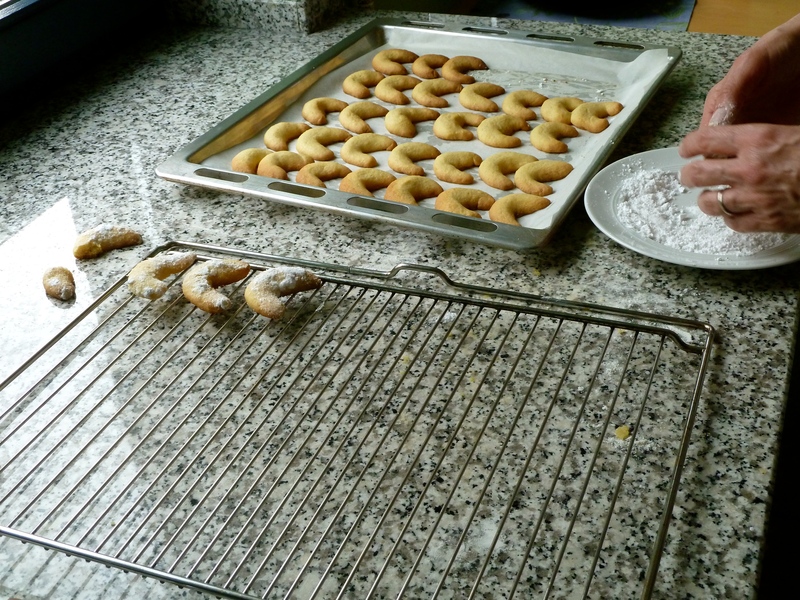 Today we made Vanille Kipferl (vanilla crescents) with Bruni, Tim’s mom, for us to take back to California for Christmas. Possibly the most loved German Christmas cookie (and believe me, there are many) Tim’s mom sends these to us every year in a festive tin to keep us company through the Advent. 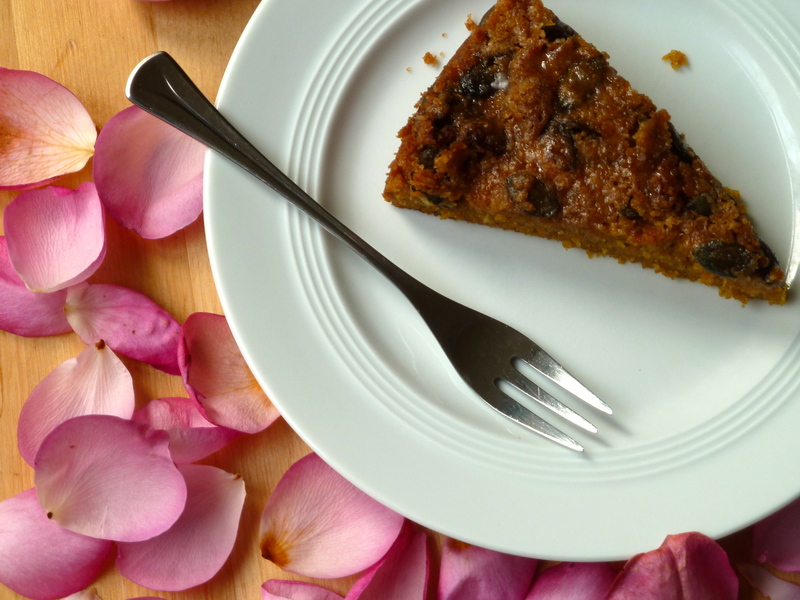 Perfect with a cup of tea or coffee in the afternoon they are somehow (amazingly) simultaneously both light and rich. I love how my first bite of Vanille Kipferl is always crisp, but as I nibble further it becomes more yielding and the overall crumbliness of the dough (from the ground almonds) I find immensely satisfying. 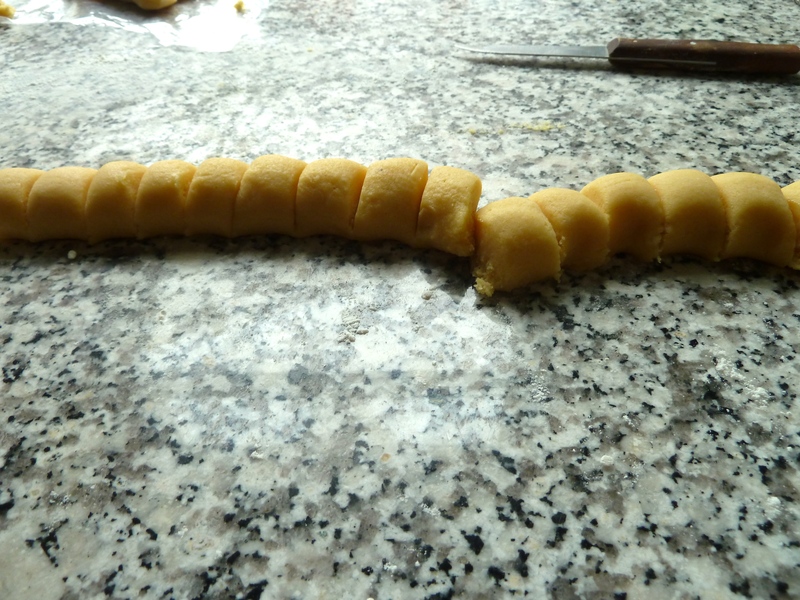 This is also a great “team-cookie.” Together Bruni, Tim and I, rolled, cut, shaped and formed dozens of Vanille Kipferl. 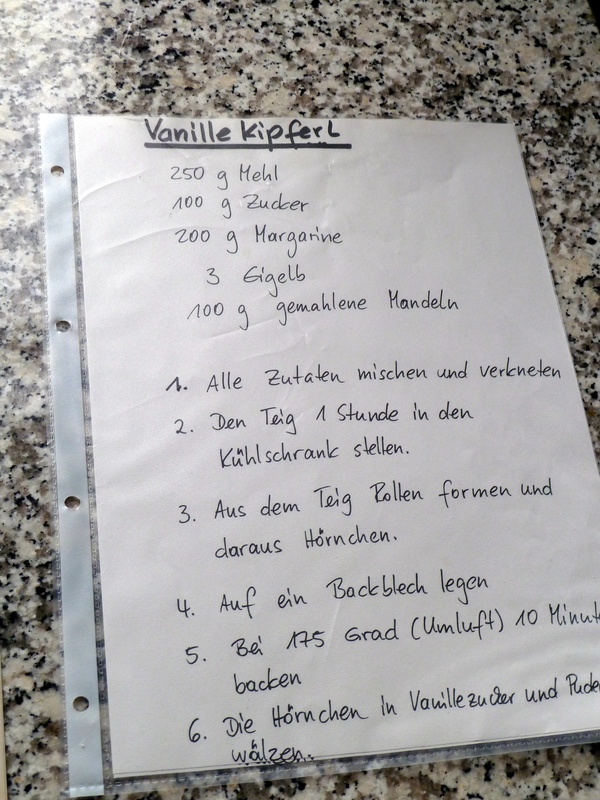 It’s easy to form a proper Vanille Kipferl assembly-line where each person (or child) has their own individual say. 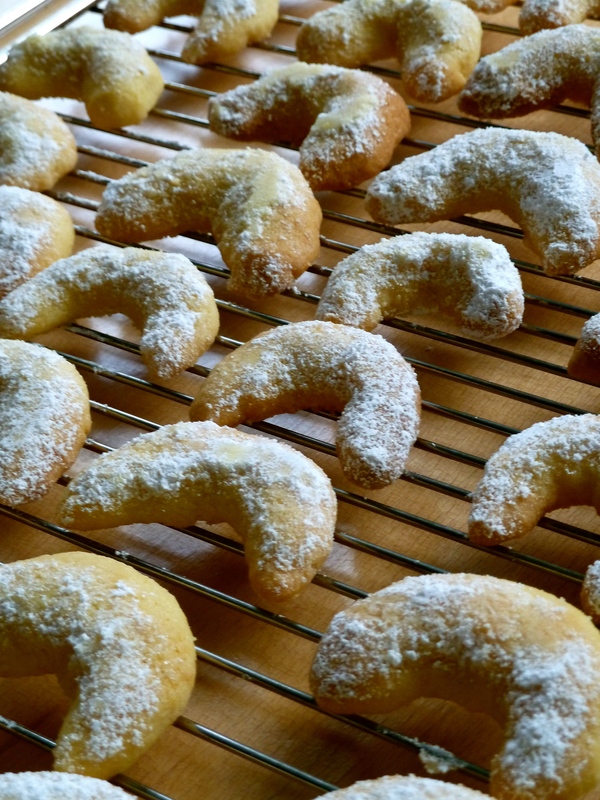 You shouldn’t stress about shaping the cookies into perfect crescents, rather they should each bear their own mark in that way which is quintessentially homemade and lovely. After a successful morning of baking I am now (gleefully) in possession of Bruni’s Vanille Kipferl recipe, which I can now share with you. We made a double batch (the best for gift-giving) which I recommend you do as well for these little guys disappear quickly. 1.Preheat oven to 180 degrees Celsius, 375 degrees Fahrenheit. Grease and cover two baking sheets with parchment paper. 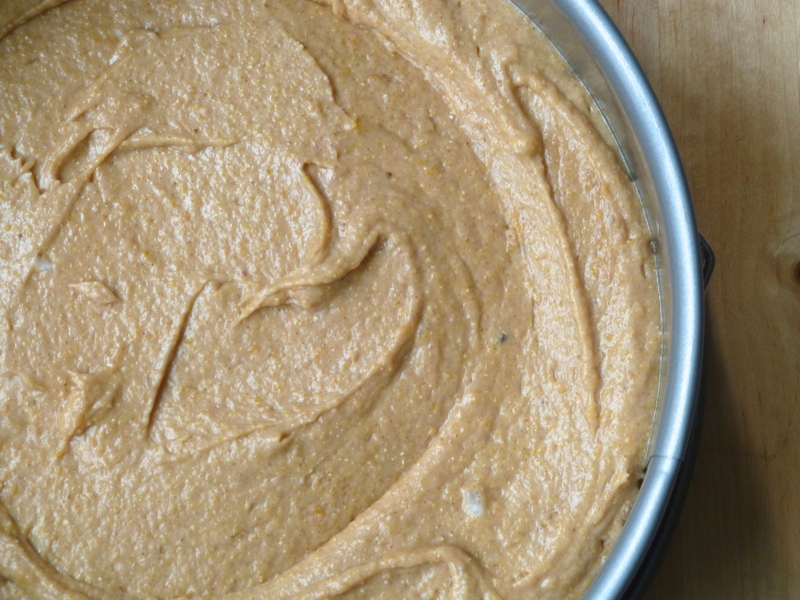 Mix all ingredients together in a large bowl, using your hands to knead the dough. The dough will be very stiff. 2. 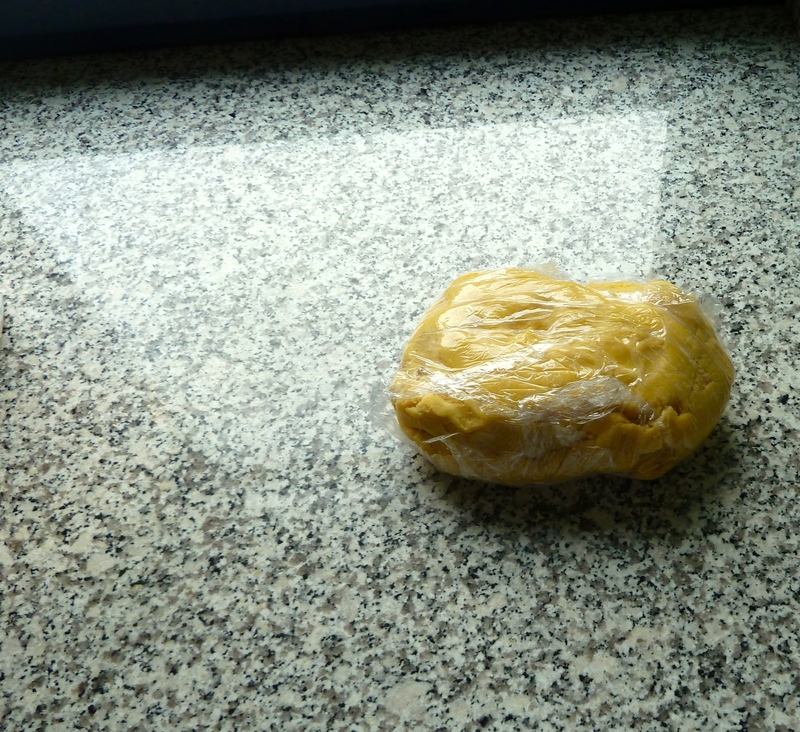 Wrap in plastic and leave in the refrigerator for at least one hour to rest. 3. 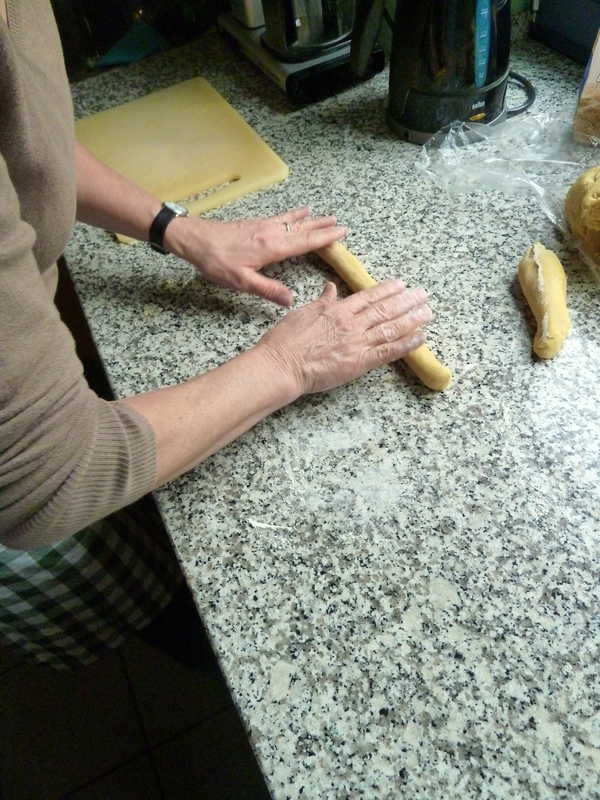 Divide dough equally into large chunks and then roll each piece into a long snake. Using a small knife cut the roll into one inch pieces. Then roll each piece between your hands to form a small even “snake”. 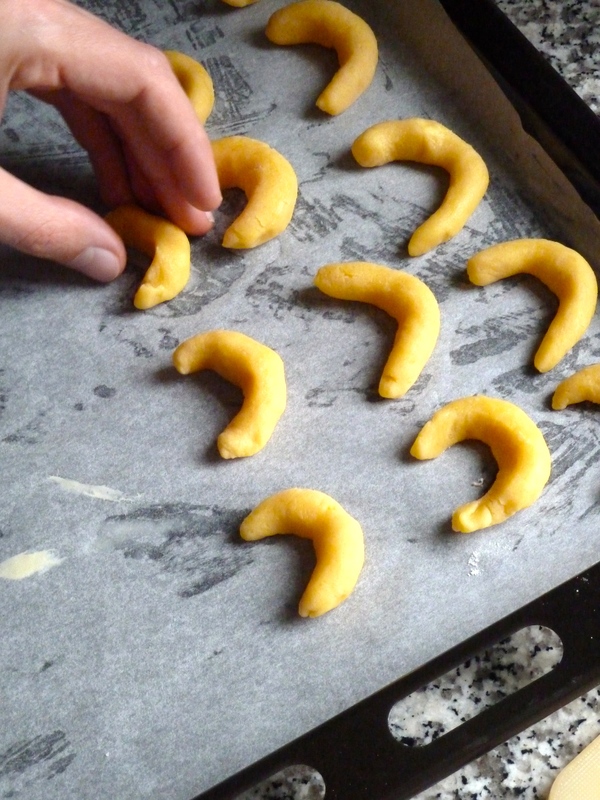 Form these “snakes” into crescents. Place on the baking sheets and bake for 10-12 minutes or until lightly puffed and golden brown. 4. While the cookies are still hot prepare your sugar topping. 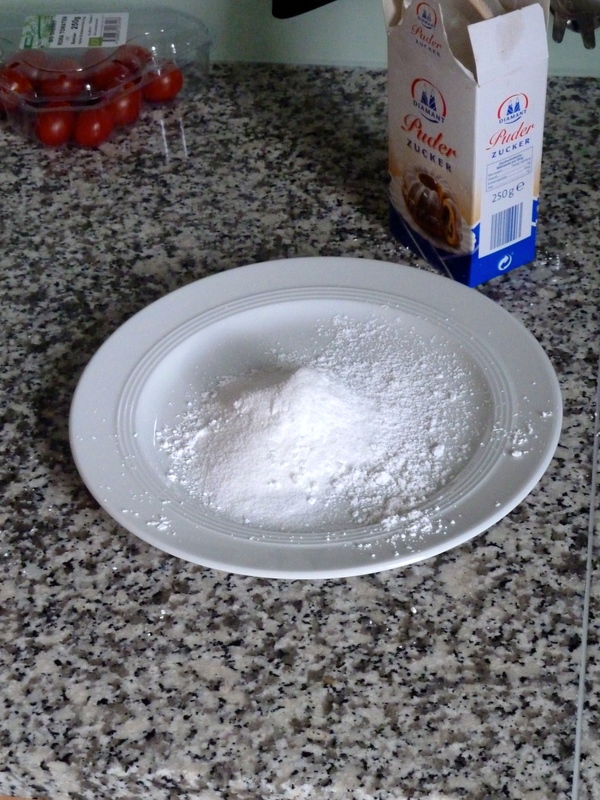 Mix equal parts vanilla sugar and granulated sugar together in a shallow basin or large plate. Dip each cookie face-down in the sugar mixture until lightly coated. Set aside. Repeat process until all cookies are dipped in vanilla sugar. Let cool on a rack and then store in an air tight container for up to two weeks. When I’m cooking for one I generally like to create some kind of extravagant salad. I pop in the market on my way home and pick up some hearts of palm or briny olives (things that don’t necessarily appeal to everyone) and a bit of pungent cheese, perhaps with a handful of herbs mixed in. I get out the fancy olive oil (the one reserved for drizzling over pasta or for sauces) and I toss in whatever else I find lurking in the kitchen. This type of cooking is to me, the most luxurious. With no one to cater to but yourself the playing field is wide open and the time to experiment is never better. During wintertime a cold meal loses its appeal. After trudging home in the frigid dark (it gets dark here at 4 pm now!) I want something hot to warm me up but the continual rotation of soup gets a bit dull and in spite of the indulgence all around me often I yearn for something virtuous. In this case I turn to a warm salad, the best of both worlds really. There’s something so pleasing about the way the warm ingredients gently wilt the lettuces. The dish becomes more whole somehow, warmer and fuller. 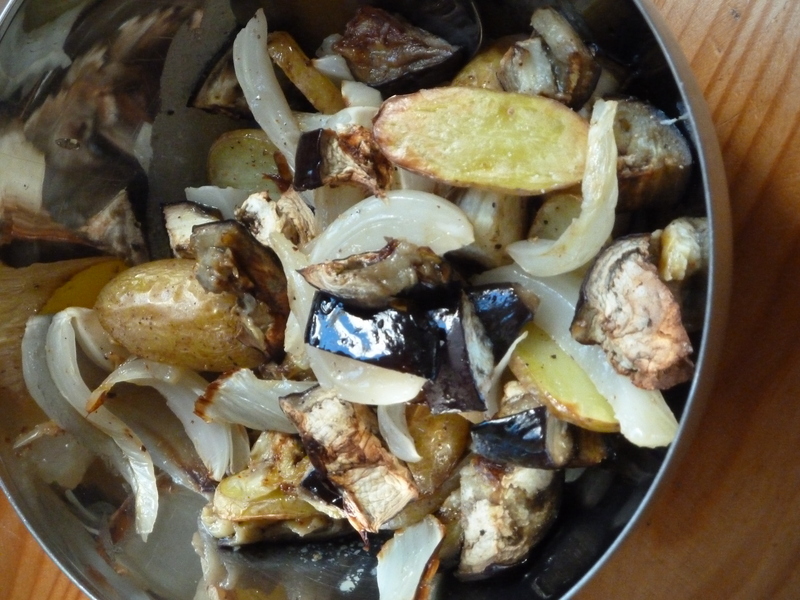 I roasted fennel, eggplant and a handful of baby potatoes under high heat until the potatoes were tender, the eggplant had charred slightly and the fennel lay in caramelized ribbons. 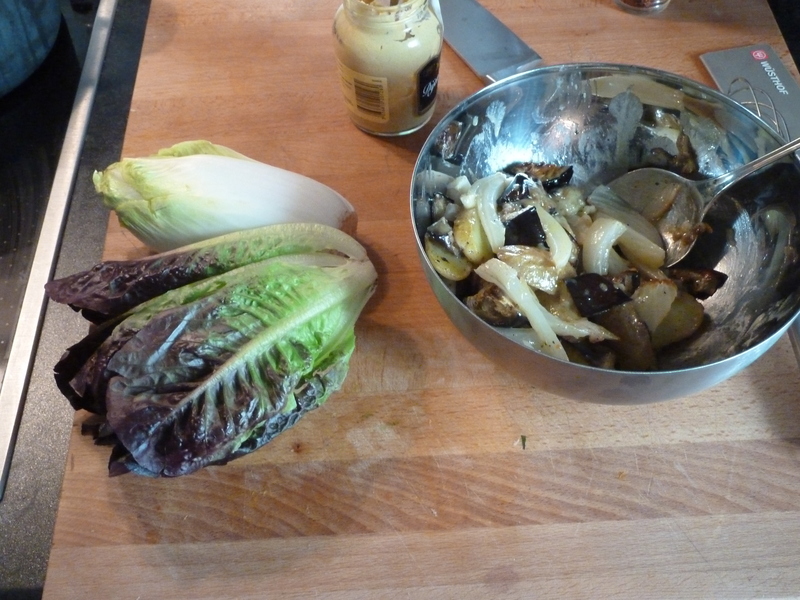 I tossed this with a mustardy vinaigrette, fresh mint, some romaine and chopped endive. It tasted amazing but lacked punch. To brighten it up I added citrus, grapefruit wedges to be exact. 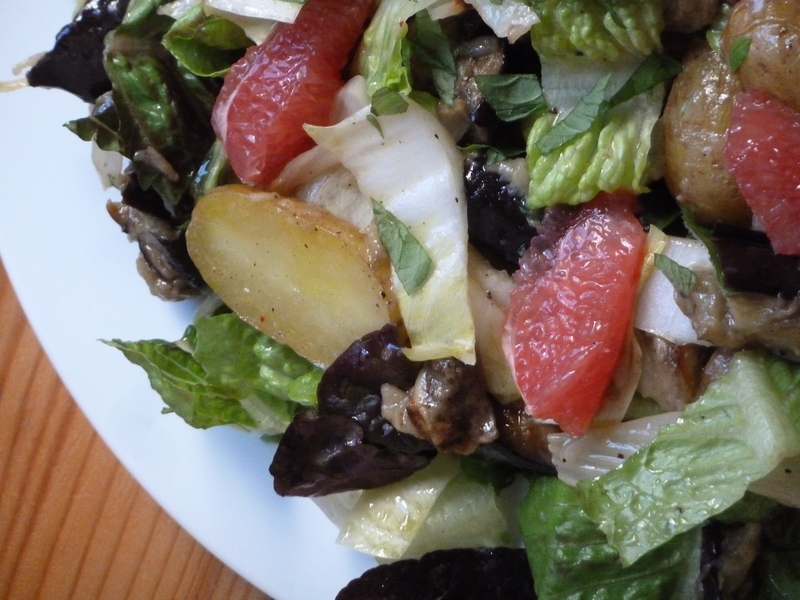 The bitterness of the grapefruit plays nicely with the sweet fennel and eggplant here. It’s interesting and flavorful, the perfect one bowl winter salad. In addition, I think this salad would also be wonderful with roasted zucchini or squash. The world is your oyster, or so they say, and you should definitely have your way with this salad. Begin by roasting the vegetables. Preheat oven to 400 degrees Fahrenheit, 200 degrees Celsius. Toss eggplant, potatoes and fennel on a lined baking sheet with 1-2 T olive oil (not the high quality stuff). 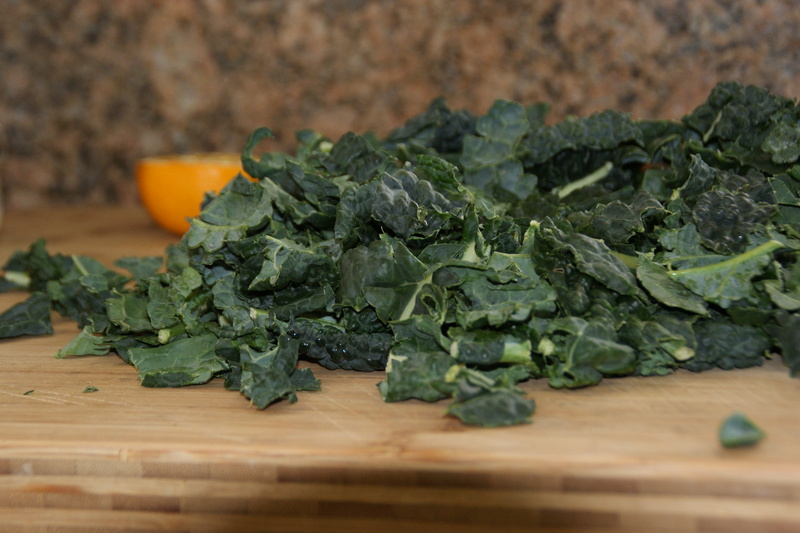 Sprinkle with salt and pepper and then roast for 25-35 minutes or until vegetables are tender. While the vegetables are roasting, make the dressing. 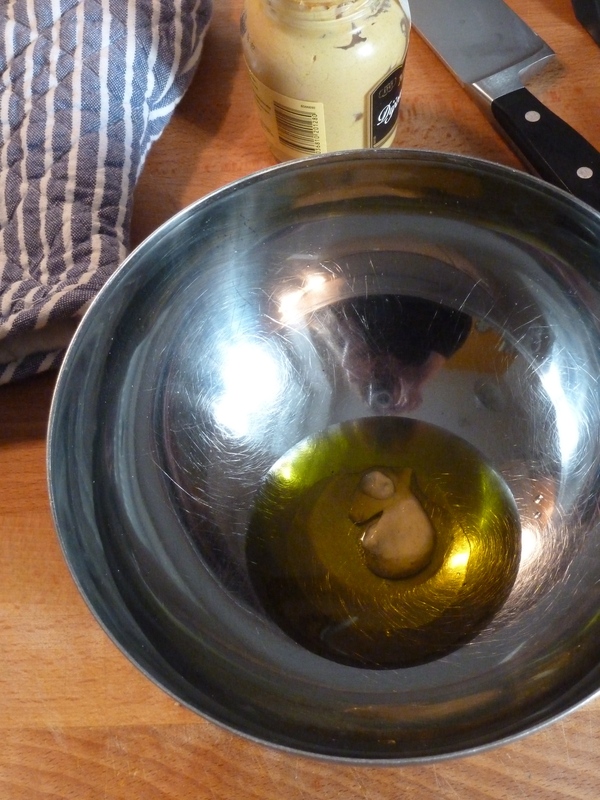 Whisk the extra-virgin olive oil, vinegar and mustard together in a medium sized bowl. Dressing should be thick and creamy. Season with salt and pepper. Set aside. When the vegetables have finished roasting remove from oven and while still hot, toss with the vinaigrette. Taste for seasoning. Next add the lettuces and mint. Toss to combine. 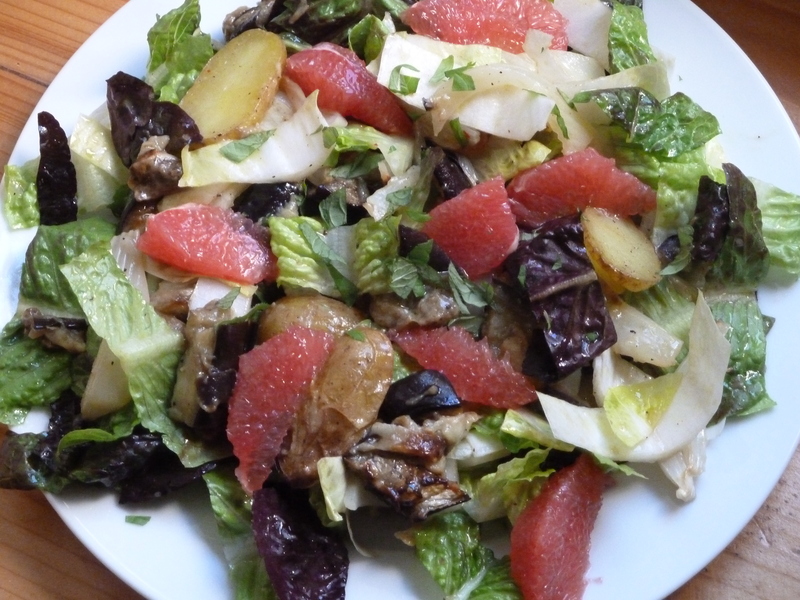 Serve salad on a large plate and top with the grapefruit wedges. Garnish with more mint if you desire. Eat alone, happily, on the couch tucked under a blanket. This is healthful gluttony at its best. 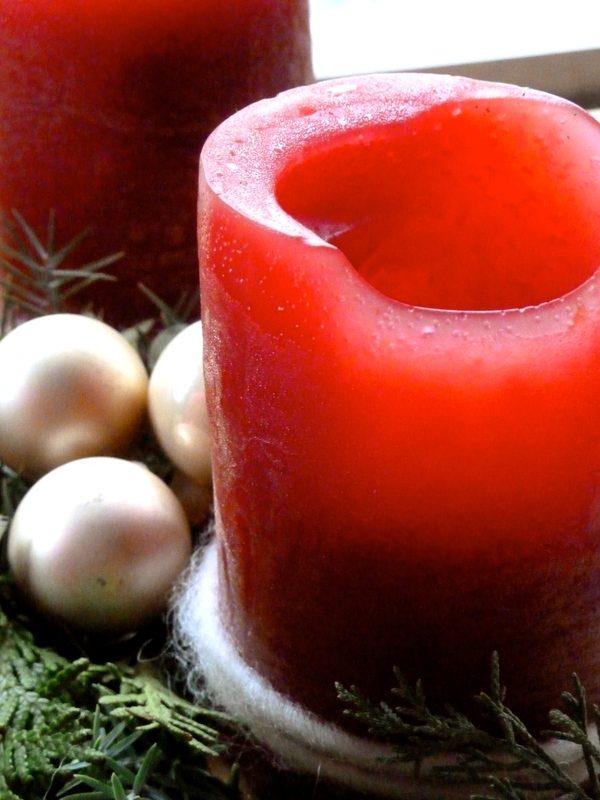 Today I felt the pressure of the holiday season acutely. So acutely in fact that I wrote the majority of this post hunched over my phone in a crowded train station. Because sometimes it just helps to write. Point being I had had a very busy morning preparing lessons and running errands all over town. As I was rushing to catch the S-Bahn back to into the city I kept going over my to-do list in my head: stop at the drugstore, buy conditioner (so you’re able to comb out your hair tomorrow without shedding a tear) get more bread, buy milk, wait, do we need milk? Buy new flowers, throw out the dead ones. Vacuum kitchen, clean bathroom, work. Do I have time to run? All of this whirled round and round in my mind, I had to be faster, there was so much to do. But then I reached the platform and saw the next train wasn’t due for 20 minutes. 20 minutes?!? Furious at what a waste of time it would be to sit on the platform and do absolutely nothing for 20 whole minutes I huffed over to the bench and sat down. It wasn’t until I was sitting there that a blanket of calm settled around me. I took a breath and looked out into the mist surrounding the platform. It was actually very nice to do nothing. There was a dog playing, a couple walking and for the moment everything was quiet. It struck me that I was so busy being stressed that I was oblivious to the life around me, all of the beauty I couldn’t see. So I went home with a different perspective. 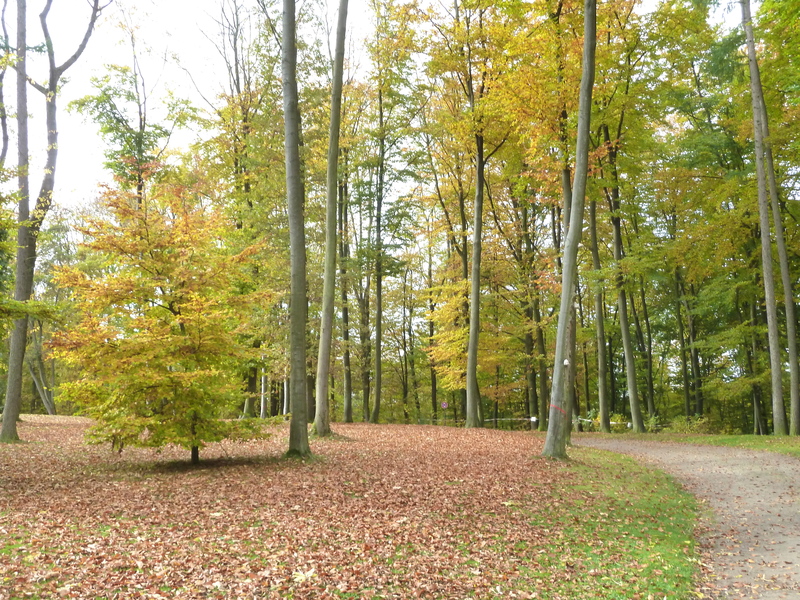 I savored my walk and enjoyed the comforting familiarity of my neighborhood. I vowed to notice the beauty that was already around me and just sit awhile as often as I could. In case any of you need a little reminder to slow down here are some beautiful little things I’m luxuriating in today. 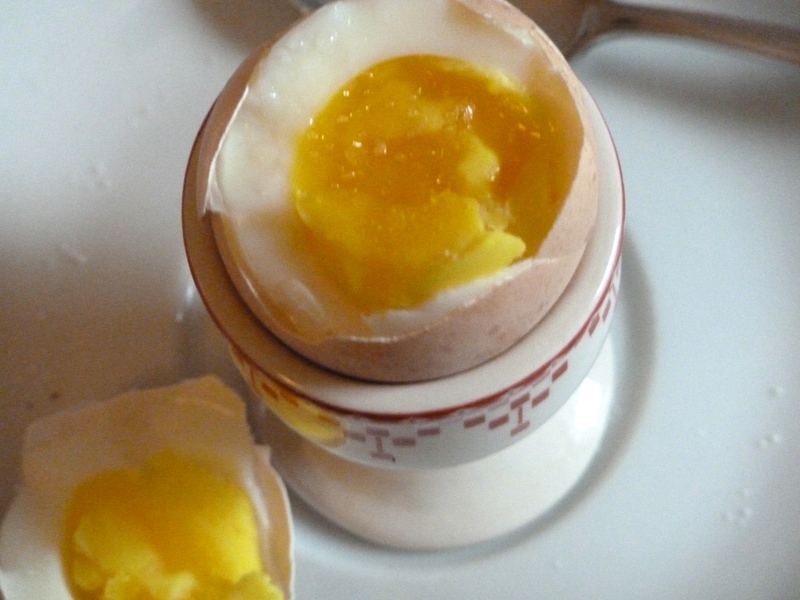 A perfectly cooked soft-boiled egg. The last of Fall color. 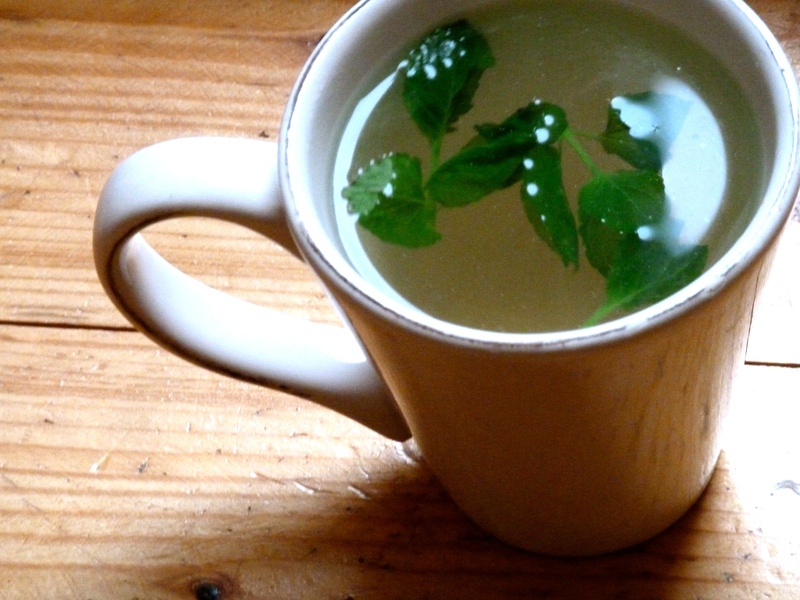 The perfect cup of fresh mint tea. I don’t know about you but after the holiday weekend I felt like I needed to be rolled back into bed to sleep off some of my excess indulgences. Not only did we celebrate Thanksgiving (and break out the stretchy pants) but we also showed off the best of the German Christmas market fare to our out of town guests. This basically involved spending the rest of the weekend trapped in a sort of (wonderful) eating marathon. If you don’t know about German Christmas markets all I can say is, come now! 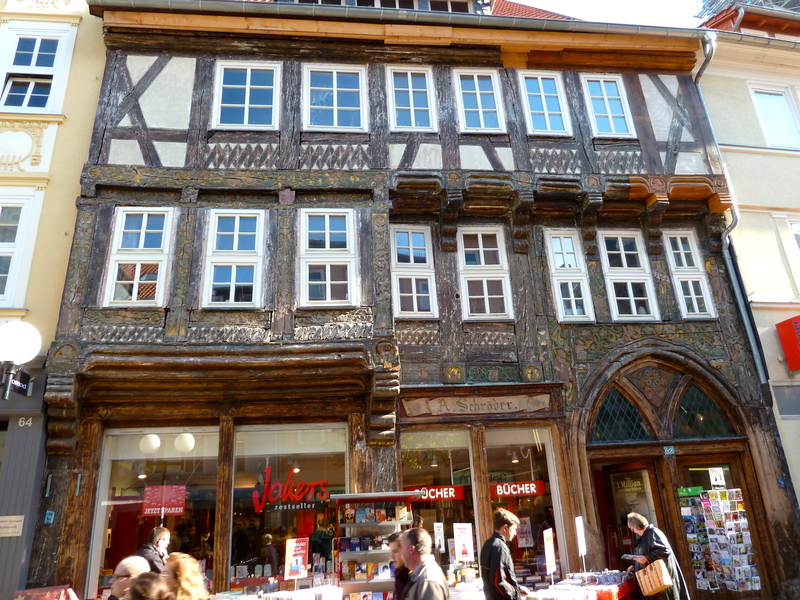 I think that Germany is the best place in the world to enjoy the Christmas season; Hannover is decked to the nines and all of the vendors have come out to tempt even the most stalwart soul into a mug of sweet Gluehwine, a potent mulled wine, or a plate of crisp Reibekuchen, decadent golden potato pancakes served with applesauce. It was a delicious weekend but afterwards what I craved more than anything was something nourishing and light to put myself back on track. Faced with a fridge full of leftovers (we hadn’t been eating at home obviously) soup was a clear solution. Pho was an even better option. To start I made my own stock with the leftover turkey by covering the bones in water, tossing in a few celery sticks and then left it to cook for 3-4 hours. 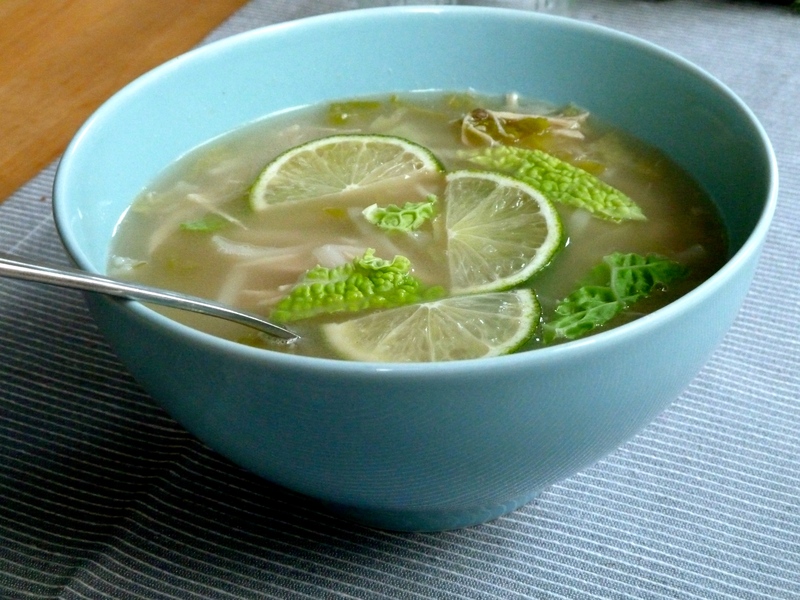 After straining the broth I had something rich and flavorful, the perfect base for my Pho. I am by no means schooled in the art of Asian cooking. This recipe from Food52 however, is easy to follow and the ingredients were a cinch to pick up at my local grocery store. Given that I live in Germany I figure it can only get easier wherever you are! The only substitutions I made were to use green cabbage in place of the kale (no kale to be had in Germany) and to omit the star anise (I’m not a fan). I also upped the fish sauce by another tablespoon; I would advise starting with one tablespoon and then keep tasting the broth and adding more if you think it needs it. If you still happen to have any leftover turkey (or stock!) please make this soup. It is hands down the best leftover turkey recipe I have ever tried. It’s delicious and filling enough for dinner without weighing you down in the slightest (a huge plus as far as I’m concerned). 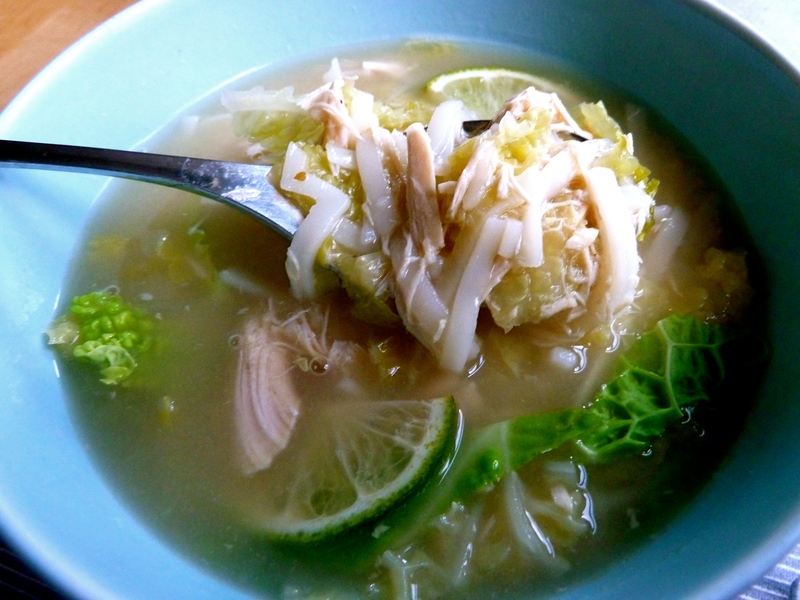 If you don’t happen to have any leftover turkey don’t fret, this soup would be equally good made with roast chicken and a homemade stock or a good quality store-bought option. Begin by toasting the spices over medium heat in a heavy bottomed pan. 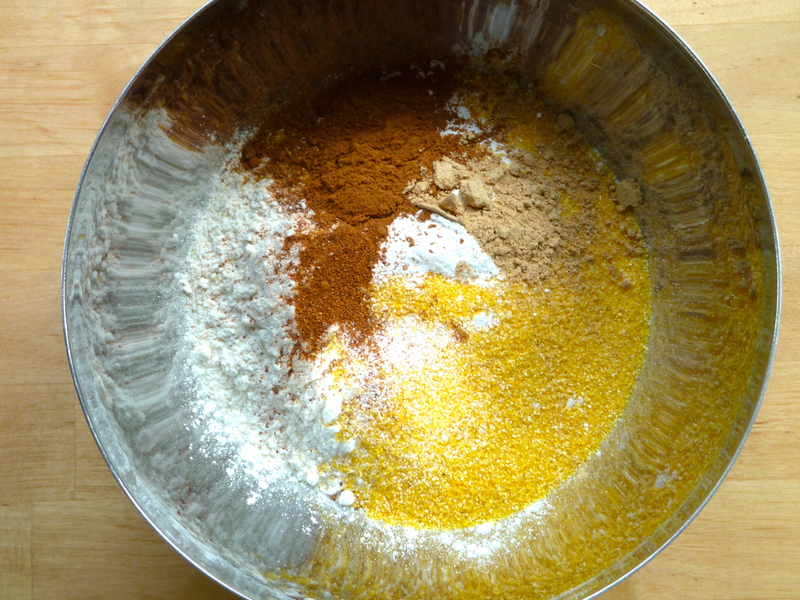 Once the spices become fragrant remove from heat and set aside. Then in a soup pot add your stock, green onions, ginger, brown sugar and fish sauce. Bring to a boil and then simmer for 20 minutes. Taste broth for seasoning and adjust if needed. Next strain the broth. Add the cabbage and cook for 1-2 minutes before adding the turkey and noodles. Remove pot from heat and let noodles soften for 3-5 minutes. 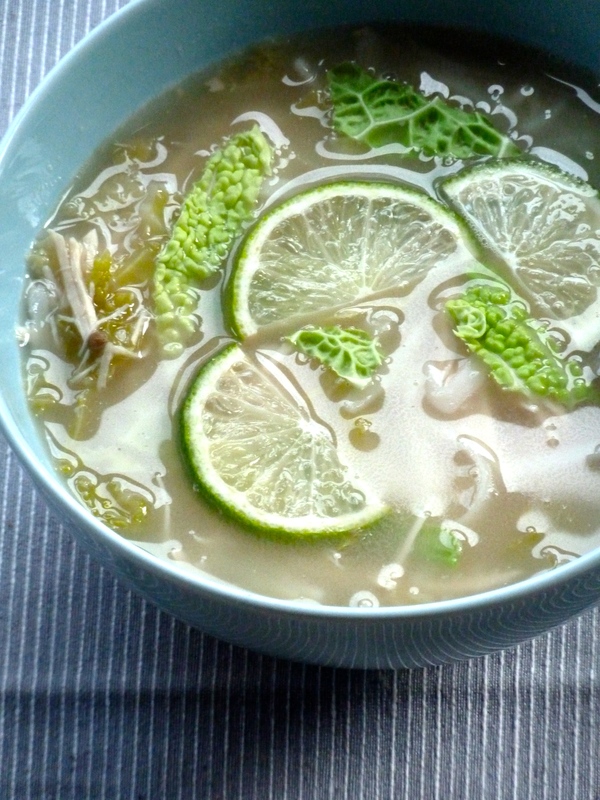 Ladle broth into two bowls and divide the noodles, turkey and cabbage between them. Garish with cilantro if using and a generous squeeze of lime. Enjoy happily, you’re being healthy! As many of you know Thanksgiving is right around the corner. This is my third Thanksgiving abroad, where I painstakingly track down elusive North American ingredients, and try and recreate my favorite recipes for all of my new friends. We ordered our turkey at the butcher’s nearly a month ago and I’m already writing up grocery lists for everything we need for the grand spectacle next week. This year I’m overjoyed that two dear American friends are making their way to Hanover from Dublin for the occasion. So we will have a very American feast even though we are all so far from home. I’m a traditionalist when it comes to Thanksgiving. I don’t care if half of the people don’t like turkey- I want turkey! At home we always have two or three types of potatoes (a must) a few pies (pumpkin, pecan and apricot) green beans, stuffing, gravy and my absolute favorite: cranberry sauce. There’s nothing better to slather your turkey with and I feel like a little cranberry flavor goes well with just about everything on the table. It’s so easy to make that there is simply NO reason to buy the stuff in the can. 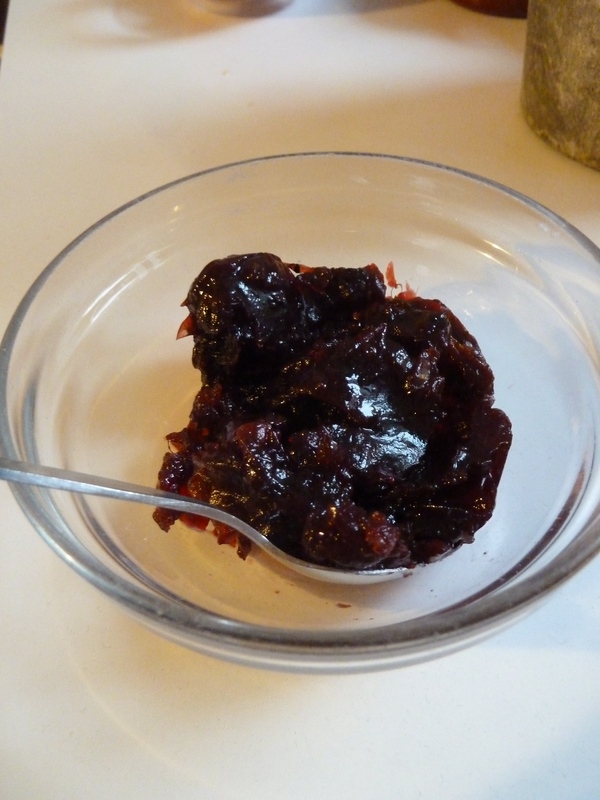 I’ve always used my grandma’s recipe when making fresh cranberry sauce. A little sugar, water, orange juice and orange zest and you’re good. Sometimes I stir in some chopped pecans for a little extra crunch but usually I like it plain. I always make extra too because it’s perfect smeared on bread the next day, with or without turkey. Last year I couldn’t find fresh cranberries anywhere. I went through a mild state of trauma thinking, “How can we have Thanksgiving without cranberry sauce?” Luckily with a little scrounging around I was able to find a tiny jar of ridiculously expensive cranberry “preserves” in a specialty food store but with ten people over for dinner it was gone in a snap and I didn’t even get a chance to try it. So recently when Tim and I were on our weekly grocery haul and I spotted a bag of fresh cranberries I practically squealed with delight before grabbing a bag and running to the check out. 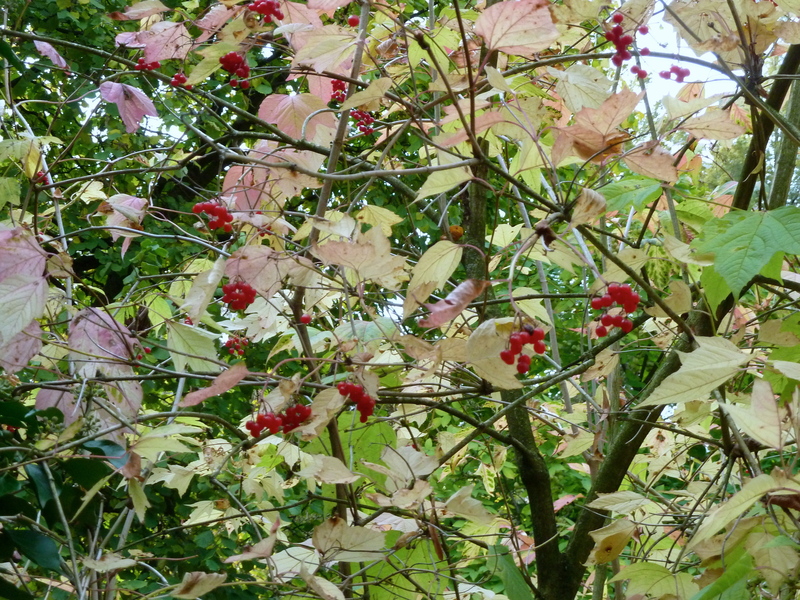 Suspicious that may have been the only cranberry sighting of the year (I haven’t seen them since!) I decided to cook the sauce last week and pop it in the freezer until Thanksgiving. I feel like these days people are throwing together boozy cranberry sauce left and right. Bourbon, port, you name it, if you can take it as a shot you can have it with your cranberry. I’m not much of a whiskey drinker but occasionally I like to sit back with a little glass and sip it slowly; it’s sure to warm you up inside and out. Even if you’re not a fan of the taste of whiskey I feel like most people can agree the smell is lovely. 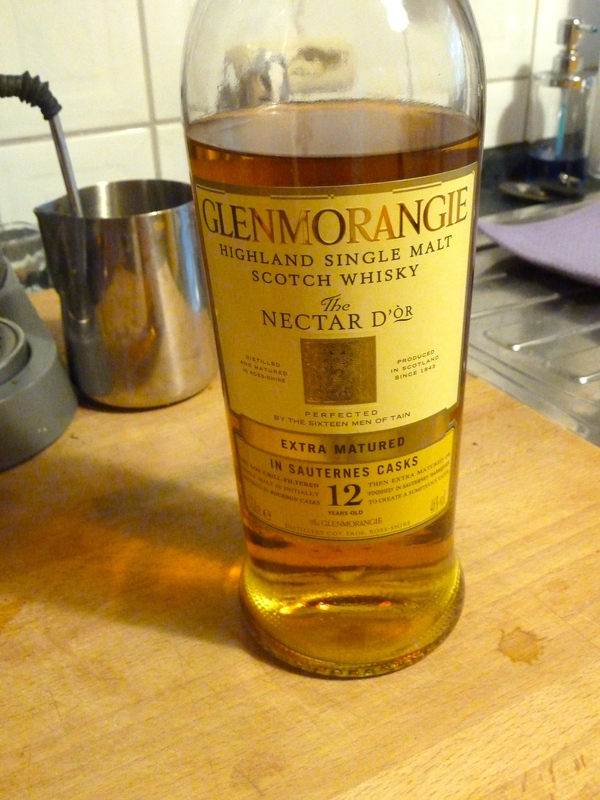 Our whiskey isn’t fancy by any means but it’s light and floral with deep honeyed tones. During the cooking process the alcohol evaporates and you’re left with a fragrant sauce that’s just a little more interesting and absolutely delicious. Something different to grace your Thanksgiving table this year and frankly something I could be perfectly happy eating with a spoon straight from the fridge. 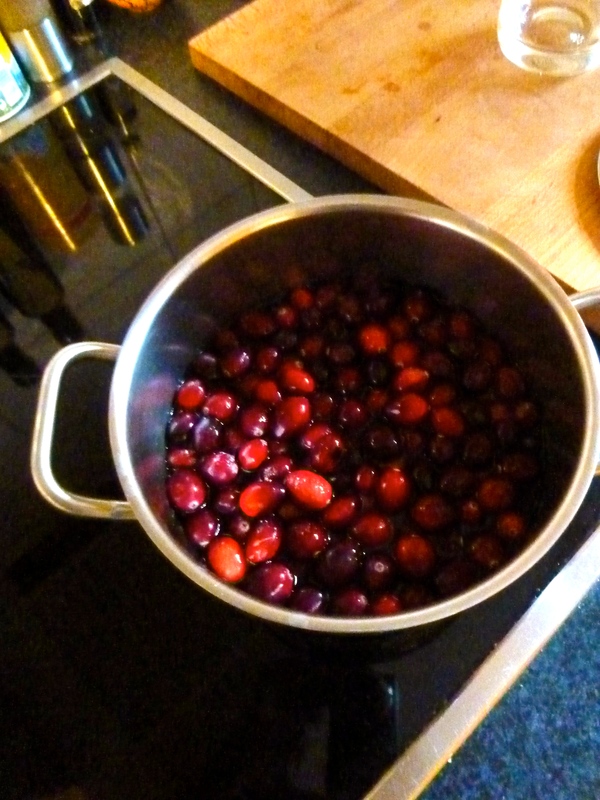 In a medium sized saucepan bring the cranberries, sugar and water to a gentle boil. Add the whiskey and stir. Boil uncovered for 15-20 minutes, stirring occasionally. Then lower the heat and simmer until the liquid has evaporated and you’re left with a thick sauce. Taste and adjust sugar if needed. 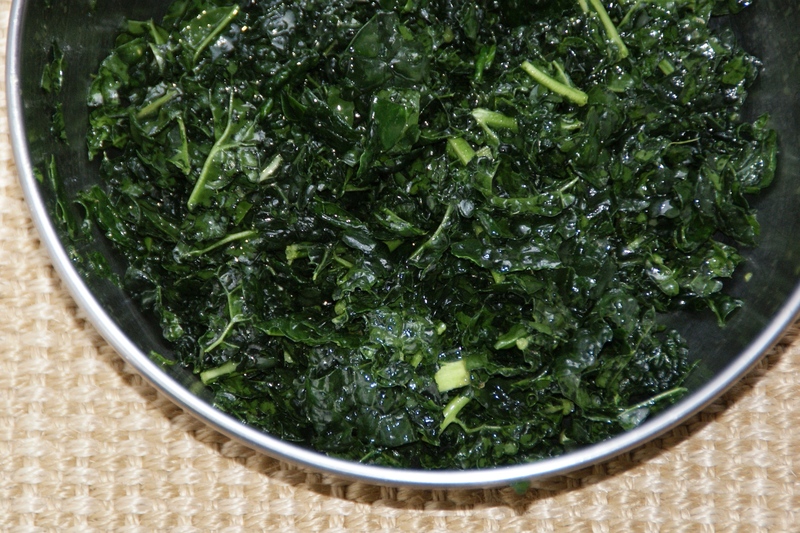 Refridgerate in an airtight container for up to two weeks, or freeze and save for the future. Cornbread takes me back. Back to my grandma’s kitchen where to this day she always manages to have a freshly baked tin waiting for me on the kitchen counter. A thick square warmed up in the microwave, topped with a pat of cold butter and drizzled (generously) with wildflower honey is the way I like it best, the perfect treat. There’s just enough graininess to keep it from being too cake-like and whether it’s breakfast, lunch or dinner I can always find a place on my plate for cornbread. My mom made us cornbread from a box. You might think this would make it unloved somehow, but on the contrary I think it made us love it even more. My mom doesn’t cook and she certainly doesn’t bake. So there was something so endearingly maternal about her side of cornbread with the evening meal. Even she could manage to throw together a batch of cornbread. Instead of the casserole pan my grandma used, my mom poured the butter yellow batter into pastel lined muffin tins. Baby pinks, blues and yellows that evoked memories of Easter eggs but were actually just the only ones she had on hand. Sometimes she even opted for the mini muffin tin (my sister and I were fans of all things mini) and I remember bringing the leftovers in a little bag to school the next day, carefully peeling back the light pink paper and gobbling up the sweet and salty muffins on my recess break. Lately I’ve been making cornbread in a pan like my grandma. I really have no better reason except that I don’t own a muffin tin in Germany yet (a situation I’m constantly on the lookout to rectify) and while I should be able to get my hands on a standard tin, I may have to lug a mini muffin tin back from the United States this year. 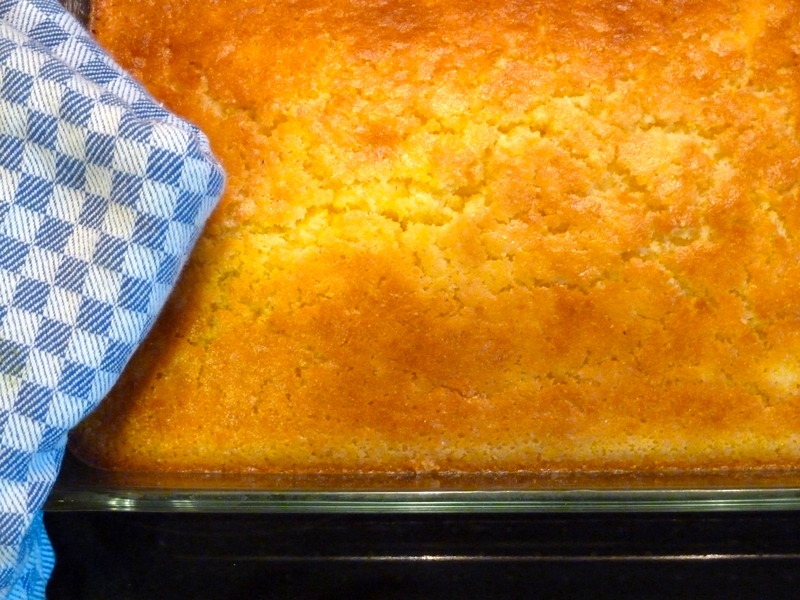 My favorite thing about making cornbread is simple: I can make it in my sleep. It is so easy- a quick bread- I can whip up the batter in under ten minutes and after 30-40 minutes in the oven it’s ready to go. Perfection at its best. Tim, being German, and therefore ridiculously spoiled in the manner of all things “bread” was skeptical about my (very) American- corn-concoction. He took some convincing but I’m happy to report that after a few batches he’s come full circle when it comes to cornbread. The only downside to this is that now we have less cornbread leftover the next day. Lately none. Ironically enough, given my history with cornbread, I don’t have any one recipe I go back to time and time again. I think I’m still looking for the perfect cornbread recipe, the one, so to speak ( I figure that at 23 I still have time in that department). Right now I make it slightly different every time. Sometimes I use buttermilk if I have it in the fridge, other times I might add a little honey in place of granulated sugar. This time I based it off a recipe that specified baking the bread in a cast iron skillet. I would have loved to do that- so if you have a cast iron skillet please use that instead of the aforementioned muffin tin or casserole dish- but of course that’s not something I have lying about my German kitchen. Though I wish it were so. There’s something so romantically Southern about cast-iron skillets; I’m a Californian through and through but I can’t help being a little drawn to that part of the country. I suppose I listen to too much country music. I must say that I was impressed with the moistness of the crumb of this cornbread. It was rich and buttery without being greasy or heavy in the slightest. 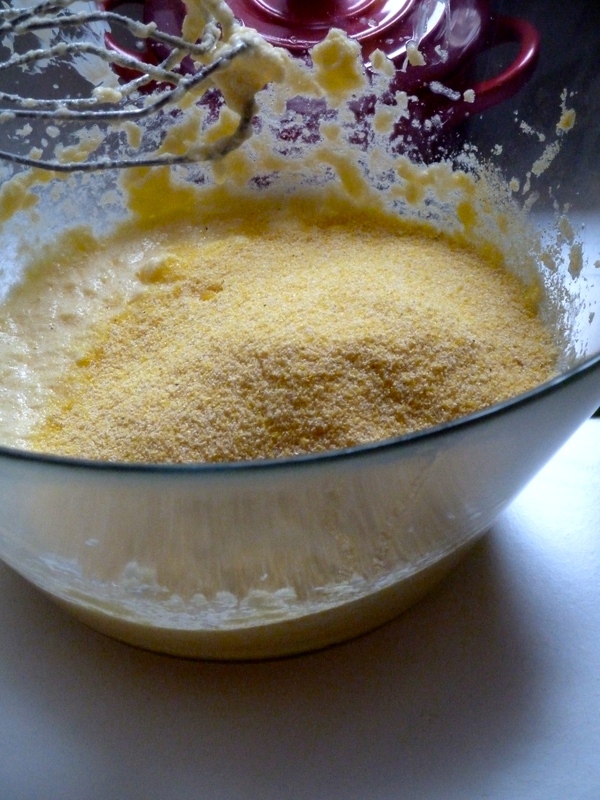 In the future I might add a bit more cornmeal to the batter; I like a little extra texture. Enjoy your cornbread warm from the oven (with cold butter and a thick drizzle of honey) or you can eat it my second favorite way: crumbled up over chili with sour cream. That is some good stuff. 4. 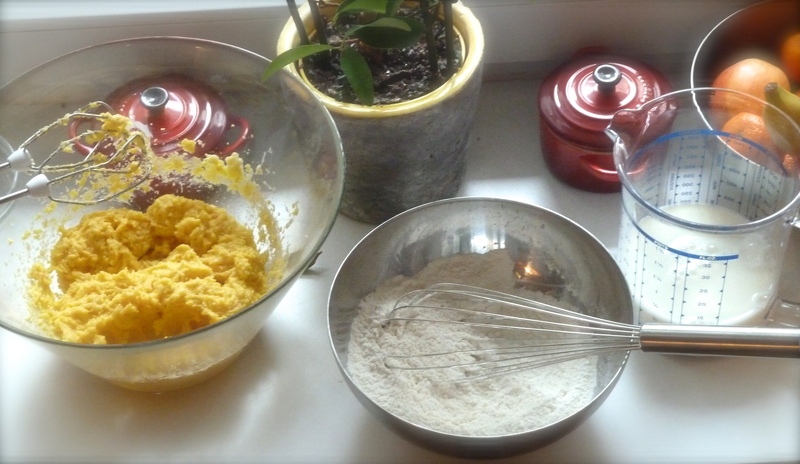 In a small bowl whisk together the dry ingredients. 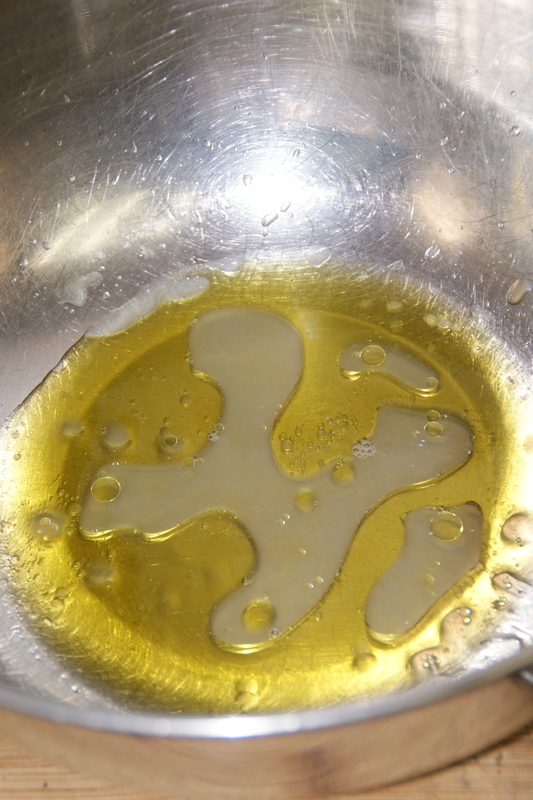 Then add to the egg and butter mixture in three stages. Alternate with adding the milk. Start and end with the dry ingredients. Oh Berlin. Look at you shining so prettily in the sun. Such a vibrant city with such good food! Last weekend Tim and I hopped on the ICE train from Hanover to Berlin (which only takes about 1 hour 45 minutes) and the plushy ride makes it go by even faster. They also have beer on tap in the dining car if you’re into that. 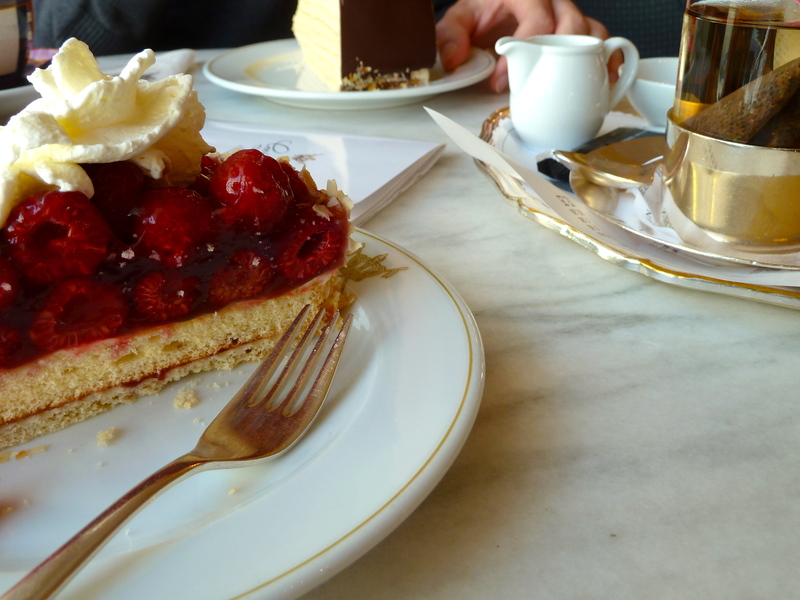 We had both been to Berlin before so this trip was more about taking in the city- and the food!- than intense sightseeing. 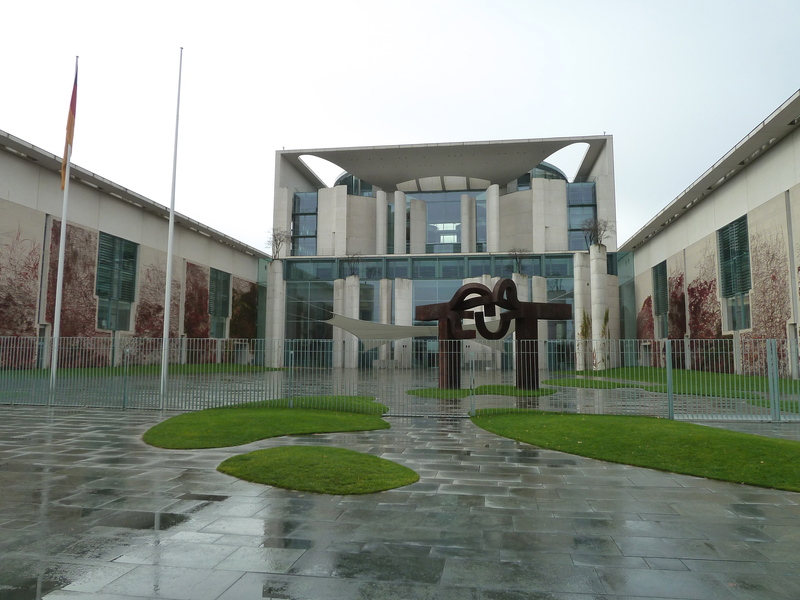 We still managed to walk past Angela Merkel’s office, shown above. The weather wasn’t great as usual and on Saturday it rained like hell so I kept the camera snug in my purse for most of the time.We spent the afternoon window shopping (Berlin is truly the place to shop) in the city center which is full of unique boutiques and trendy shops. We even stopped by the infamous KaDeWe (the largest (FANCY) department store in Europe) where I bought a new tube of mascara at the Benefit counter after letting the stylists have their way with me for a bit. We meandered up to the top floor which has a food court that puts all the others to shame- I’m talking fine champagne and lobster tails for an afternoon snack-but we just bought a chunk of Valrhona for later and nipped out of there. 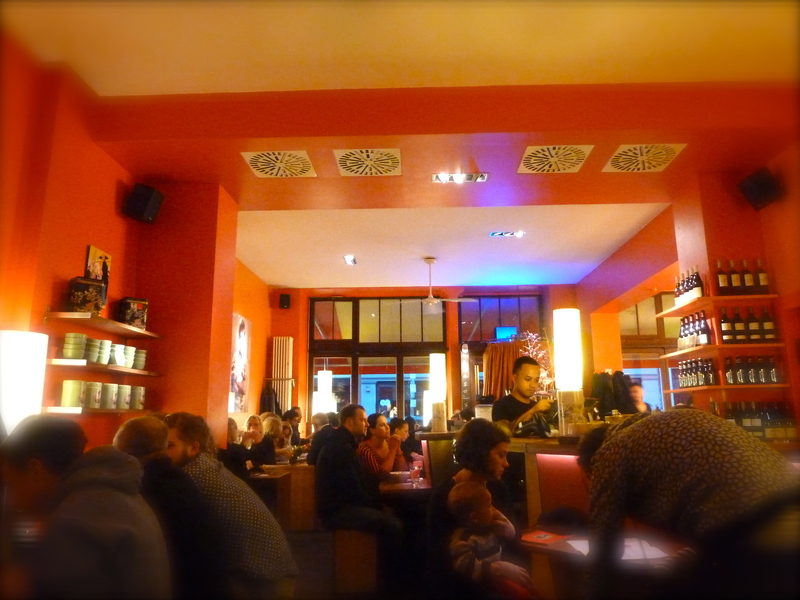 For dinner we headed to Kreuzberg to Bar Raval, a fantastic tapas bar. It’s a little out of the way but worth the trek on the U-Bahn. We were so hungry that we fell on our tapas like starved wolves, so sadly no pictures to share. 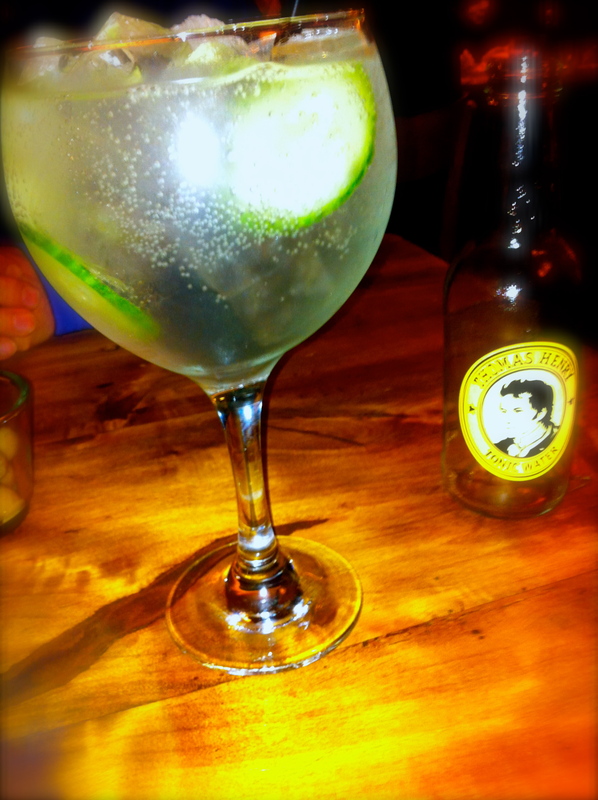 I did manage to snap a photo of the gin and tonic I ordered; being a huge gin and tonic fan I was thrilled to see the extensive gin menu available. I chose the classic Hendricks g+t, which is my favorite and as they serve it here in an impressive goblet garnished with paper thin slices of fragrant cucumber and a little (cute!) bottle of Thomas Henry tonic water on the side, I was a very happy girl. 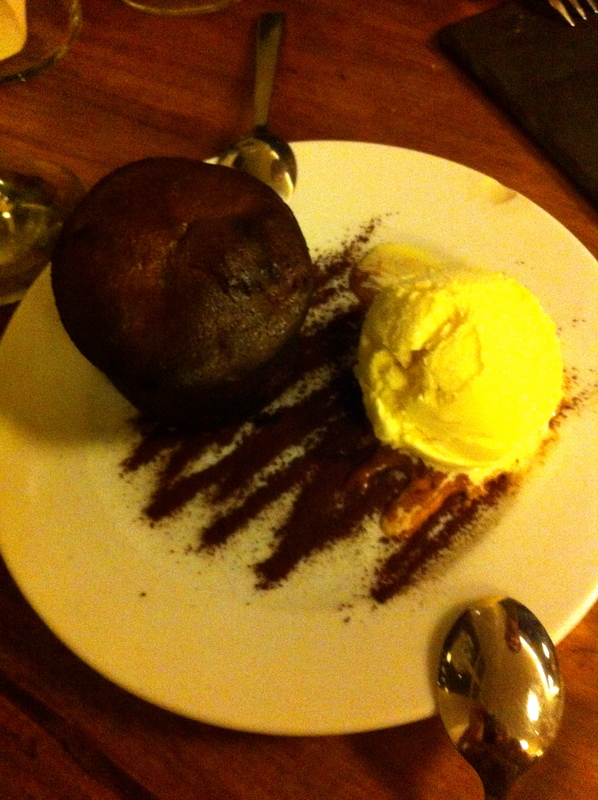 Dessert was a two part affair with a cheese plate to start and a molten chocolate cake to finish. Maybe it’s a little cliche but I can never have too many molten chocolate cakes. That gooey chocolate center is sinfully good and it had the tiniest trace of cinnamon, just enough to keep you wanting more. All in all I wholeheartedly recommend Bar Raval. The tapas are delicious and the gin menu and chocolate cake is enough to keep me coming back every time I’m in Berlin. 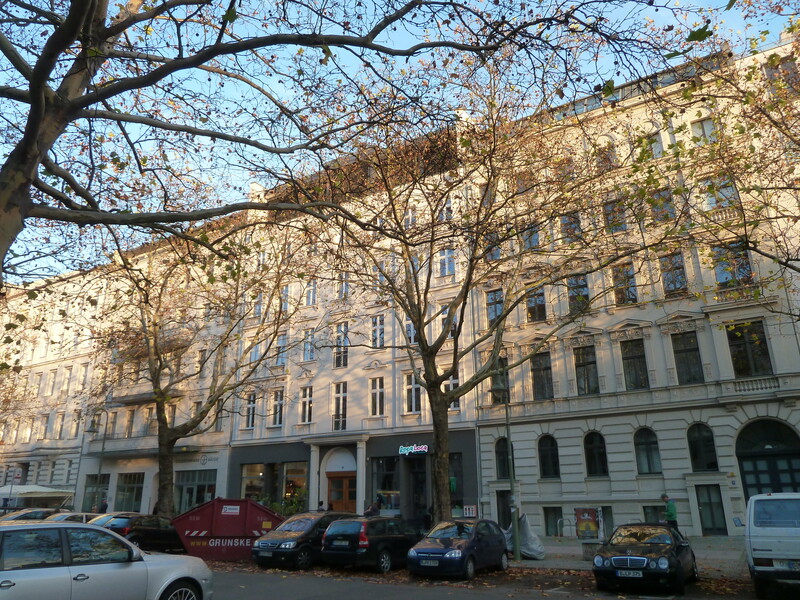 We also spent some time in Prenzlauer Berg, a trendy district known for high rents and its fine selection of restaurants and bars. This shop (above) caught our eyes firstly because it looked like a kitchen store or maybe even a specialty foods store from the street. Not needing much more persuasion we headed in to find that it’s actually a kind of ready to go grocery store where people can buy all the ingredients they need to make a specific recipe. 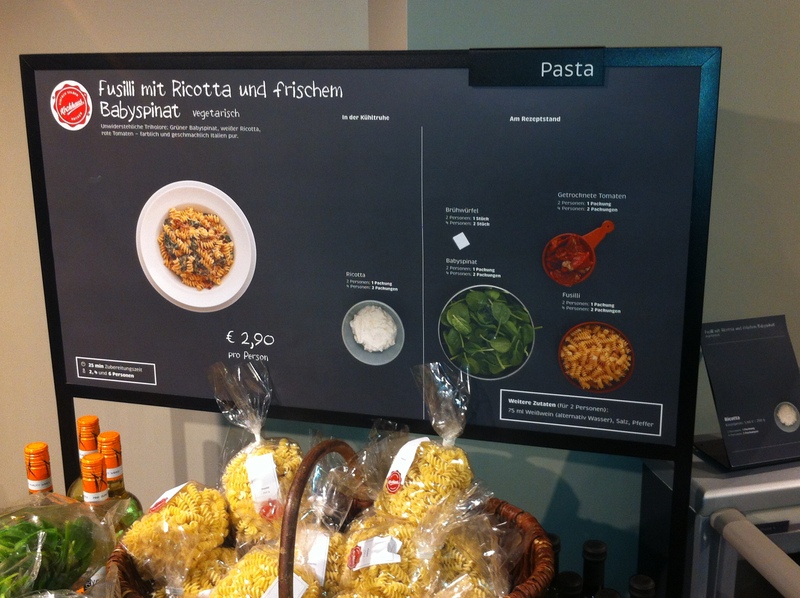 So for example you can decide to make this fusilli with ricotta and baby spinach, they provide you with a recipe and everything you need to turn out this restaurant quality dish in your kitchen at home. Pretty cool right? The place was packed with people buying stuff while we were there so it seems pretty successful. Tim and I kept thinking it was a cool business idea. 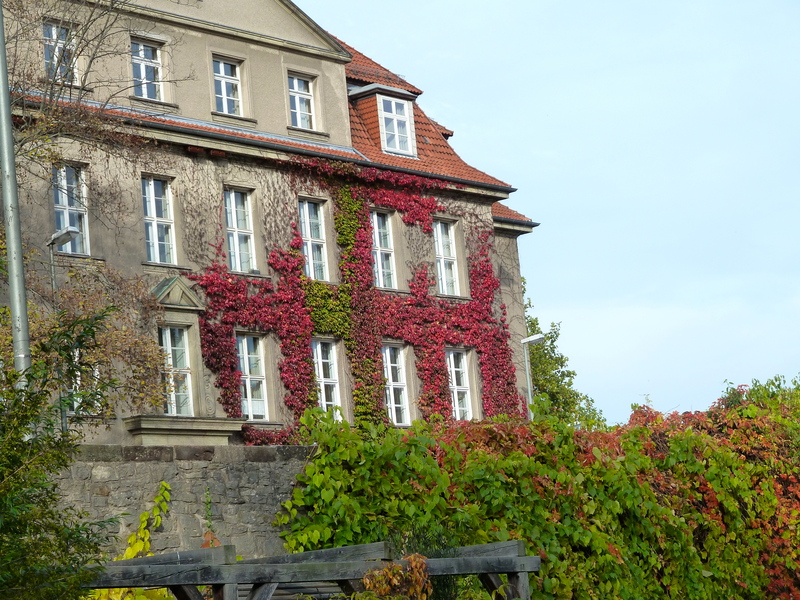 On Sunday afternoon after a day spent in the Deutsches Historisches Museum and a walk in the sunshine (the rain went away!) we stopped by this Vietnamese restaurant, Monsieur Vuong, for an early dinner before taking the train back to Hanover. Normally we avoid Asian restaurants of any kind in Germany unless we’ve read some good reviews or have friends recommend a place to us because frankly we’ve had too many bad experiences. This place had a line down the block though when we passed it on Saturday during our window shopping extravaganza and the smells emanating from the entrance were nothing short of drool-worthy. Suddenly I couldn’t get the image of a steaming bowl of pho out of my mind and we decided to come back and give it a try. For an appetizer we shared some spring rolls which were tasty and gobbled so fast I forgot to take a picture. I thought an empty plate wouldn’t be that interesting. I also had this bowl of passion fruit tea. 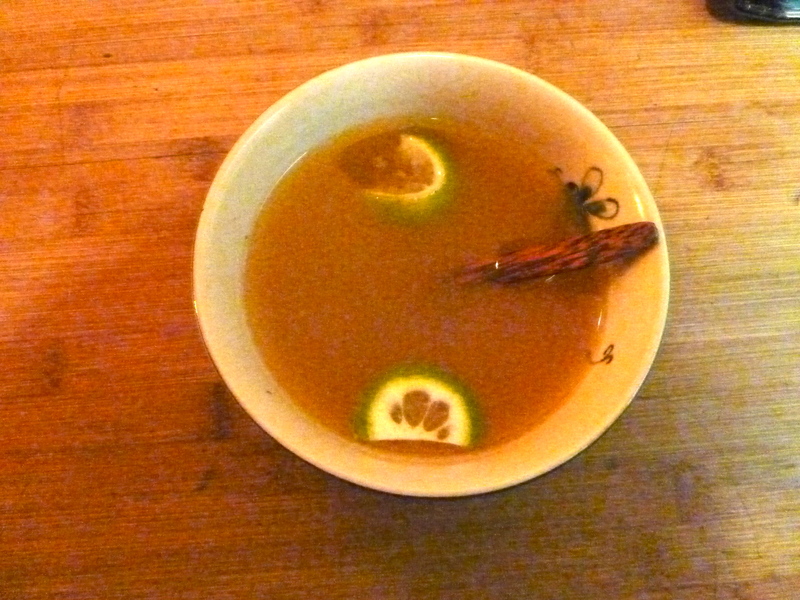 Sweetened lightly with honey and infused with lime this was the perfect antidote to a cold day. It was so delicious that I keep kicking myself for not asking about where to buy the tea leaves, I would love to be able to make this at home on a rainy day….which right now is basically every day! For the main event we both got the wonton soup. 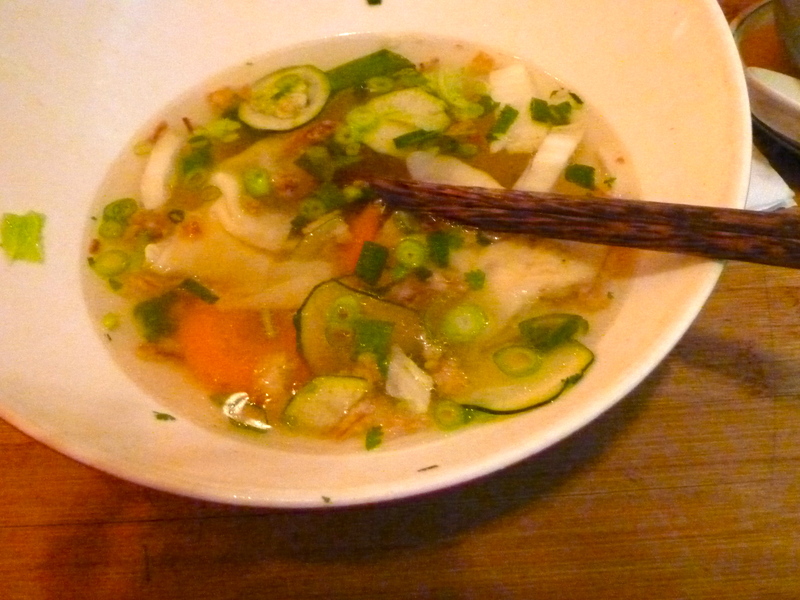 The broth was flavorful and light but the wontons were what made this soup really special. Stuffed with a mixture of pork, beef and herbs they were incredibly filling. Tim’s favorite part of the dish were the roasted onions sprinkled on top of the soup (he’s a roast onion fanatic) and I have to admit they were pretty good. When we left to get back to our train I kept thinking how much I wish we lived down the street from this restaurant. Everything was so delicious and prices were very inexpensive for the quality. I think I could get used to having a bowl of their wonton soup every week. But then again I think if we lived in Berlin all we would do is eat! I told you recently about making your own roasted “pumpkin” in the place of using canned and I also told you about my intense pumpkin bread craving and my failed low fat, whole-grain, low-sugar version. I want to assure you that I didn’t forget about it- quite the contrary actually, I just hadn’t found a recipe felt right. This all changed last week as I devoured the recent posts of some of my favorite blogs and I went agog over Beth’s crème fraiche, cornmeal & pumpkin coffee cake +pepita streusel over at Local Milk. It was the answer to my pumpkin prayers. If you’re anything like me you’re probably reading this thinking woah, that’s a lot of stuff to throw in a pumpkin cake. It is, I can tell you- but it’s so worth it. You end up with a cake that is undeniably pumpkin but transcends the murky pumpkin pie flavor profile which I’ve decided is totally overrated. 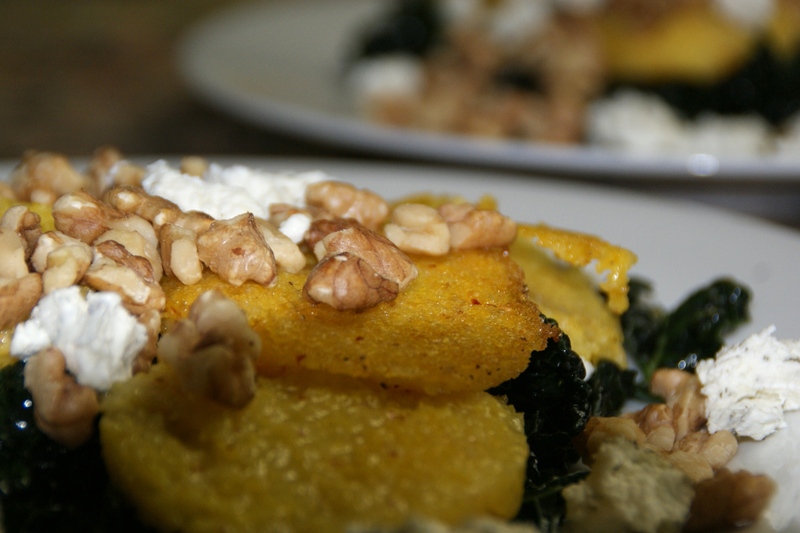 What really caught my eye with this recipe was the cornmeal. 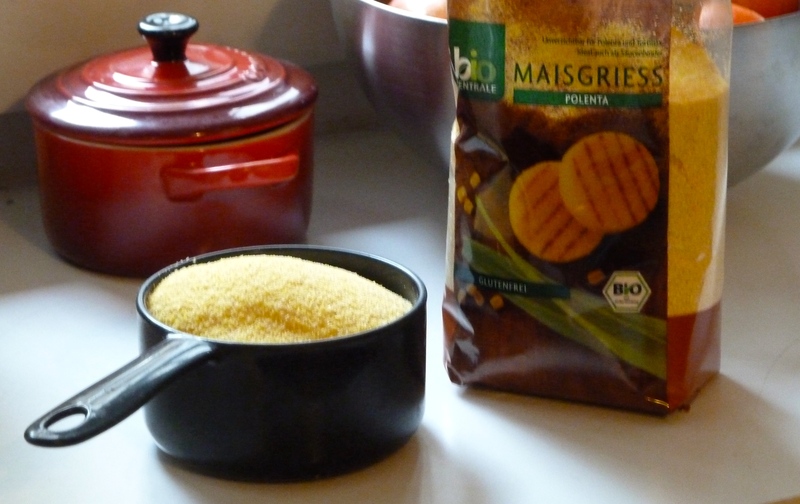 I LOVE cornmeal. Any chance I have to throw a little cornmeal in, I do. It adds such a lovely grainy texture and just the tiniest hint of crunch. Interestingly enough, the recipe also calls for coconut oil instead of your standard vegetable oil of softened butter. I was a little skeptical at first, having never baked with coconut oil, and when I unscrewed the lid I was hit with such an overwhelming coconut smell I felt like I should be slathering this all over my body instead of using it in a cake. After baking though, I was surprised at how nuanced the flavor is. 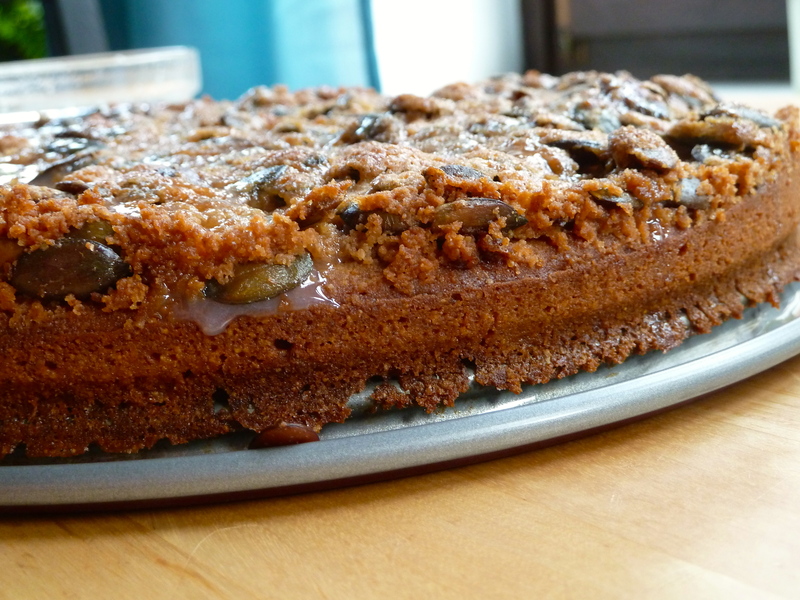 The cake is definitely pumpkin- the coconut oil keeps the crumb incredibly moist and there’s not even a whiff of anything resembling your beach-side pina colada. I must say- I’m still thinking about using it as a moisturizing agent actually, I think I should do a little research first though- I wouldn’t want to break out in hives or anything. We’ll see how it goes. I served this last weekend to Tim’s parents while they were visiting us in Hanover for the weekend alongside my favorite Red Currant Torte (had to play it a little safe). Because to be honest I was a little nervous that this cake might be too sweet for them. And let me just say, it is very sweet. I used my last reserves of precious American dark brown sugar (impossible to find in Germany) but it was totally worth it. I think in the future I might cut back on the sugar a bit. 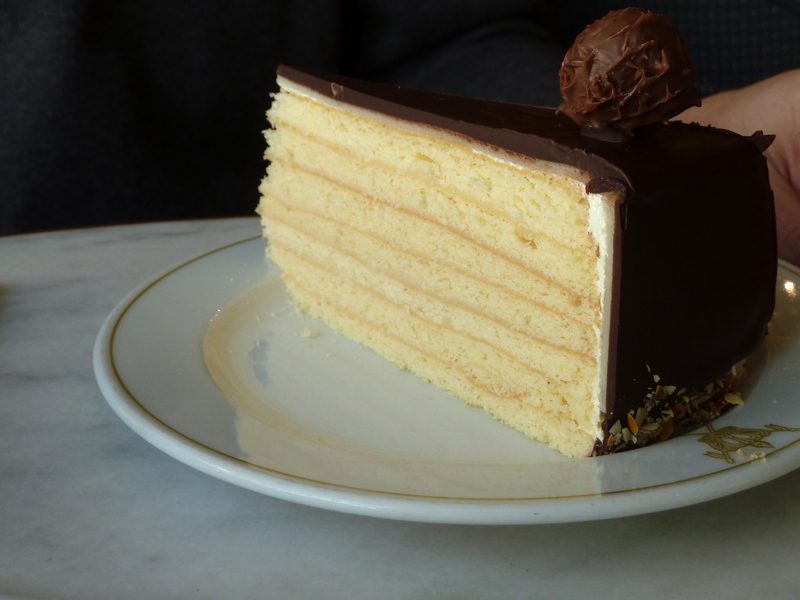 After nearly a year and a half in Germany my sensitivity to sweetness has certainly become heightened and the flavors in this cake are so developed that I really don’t think you need the extra sugar. Nonetheless a small slice with a cup of strong coffee is a winning pairing and the perfect way to indulge in the very best of Autumn’s bounty. If you want you can add a buttermilk glaze to the cake after it cools by mixing 3/4 cup of powdered sugar with 2 T of buttermilk. I tried some glaze on part of the cake but after trying it decided to forgo the glaze since it was already so sweet. But that of course is up to you. 1. Preheat oven to 350 degrees Fahrenheit (180 Celsius) and grease a 9″ cake pan or cast iron skillet. 2. In a medium mixing bowl whisk together the first 9 ingredients and then set aside. 3. 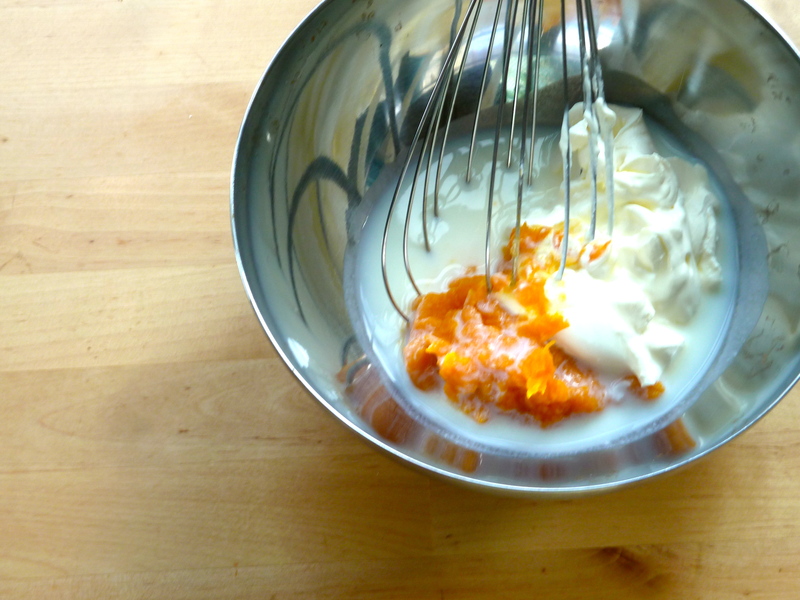 In a second medium mixing bowl whisk together the pumpkin, creme fraiche and buttermilk. Set aside. 4. 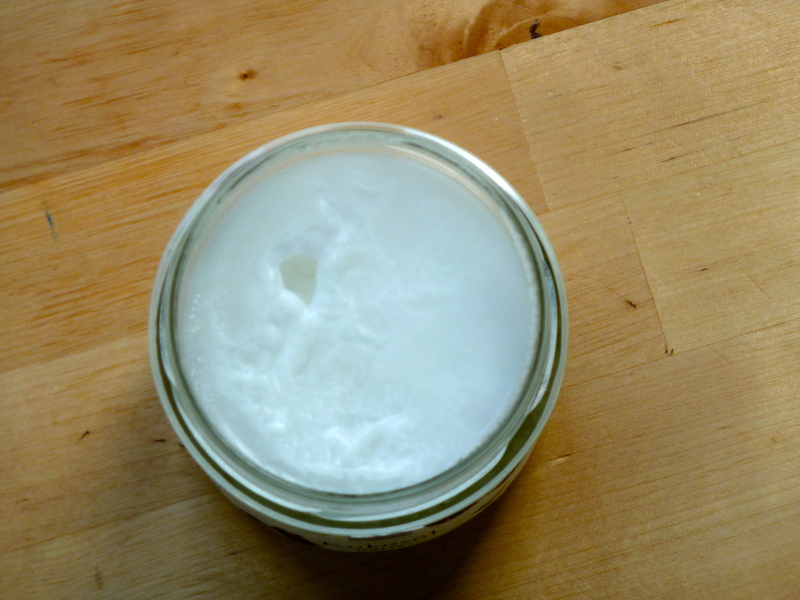 With a hand or standing mixer cream the coconut oil with the brown sugar until well combined. 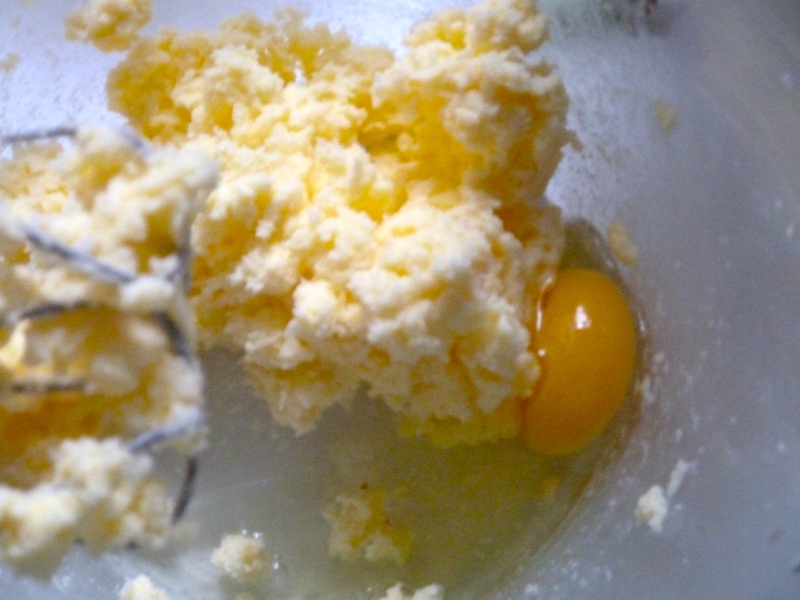 Then with the mixer on low add the eggs one at a time until fully incorporated. 5. In three additions alternate adding the dry and wet ingredients, ending with the wet. 6. Pour into prepared pan and bake for 20 minutes. Meanwhile make the streusel. 7. Combine all ingredients for the streusel except the pepitas. Using two knives cut the butter into the flour. Once the mixture resembles small peas add the pepitas and mix by hand. 8. After the 20 minutes have elapsed remove the cake and sprinkle the streusel evenly over the cake. Return to the oven and bake for an additional 30 minutes. 9. Once the cake has cooled either serve as is with strong coffee or with the buttermilk glaze drizzled over the top. I wondered if I should tell you about my weekend this morning, since I was and undeniably, still am in the unfortunate funk we call the post-weekend blues. Where all the glorious weekend activities are still freshly stamped on your mind and it doesn’t matter if you spent the weekend in bed with a bowl of popcorn and a Gilmore Girls marathon or if you actually went somewhere and did something with someone you find fabulous. Because regardless the weekend is over and now you’ve got a new week ahead of you with appointments and responsibilities and all you really want to do is pop another bag of popcorn and snuggle back under the covers and watch just one more episode, just one, before you tackle the week. Or maybe you had a crappy weekend and so you’re glad to be back at the grind or wherever it is you spend your 9-5 but right now I’m spending my time in that uncertain limbo of the nearly unemployed. That time when you spend every waking minute looking for work- looking for something to do- and trying not to feel like your only purpose every day is to kill time. I try to break up my day and between the looking for work process that we all know and love so much I do a little yoga, go for a run, fit in some studying for the GRE (as it looms closer on the horizon) and prep for the one class I have so far (a Medical English course where I’m trying to learn all the material before I have to teach it) and I also get a ridiculous amount of pleasure out of simply going to the little organic grocery store around the corner from my house. While I shopped this morning I fell victim to the store’s wickedly sly marketing and came home with an extra box of Speculoos cookies and chips and salsa to boot. I went for the chips first (the healthier option for my midmorning snack?) only to give up after trying-in vain- to crack open the jar of salsa. I tried everything but the little jar beat me. Maybe the universe is trying to tell me something? I’ll leave it there for Tim to tackle when he gets home but really you’d think I could open my own jars. 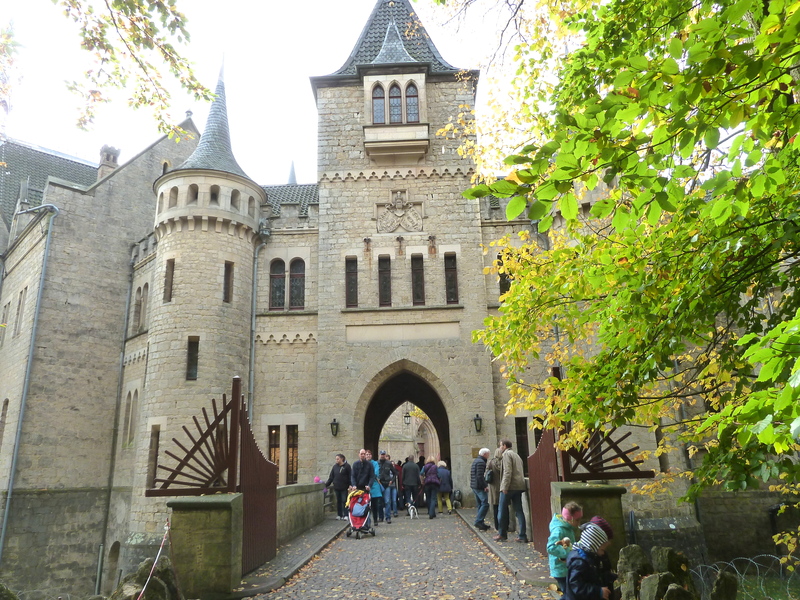 In the meantime- check out some photos from our weekend jaunt to Goettingen this weekend and Schloss Marienburg- a castle (! 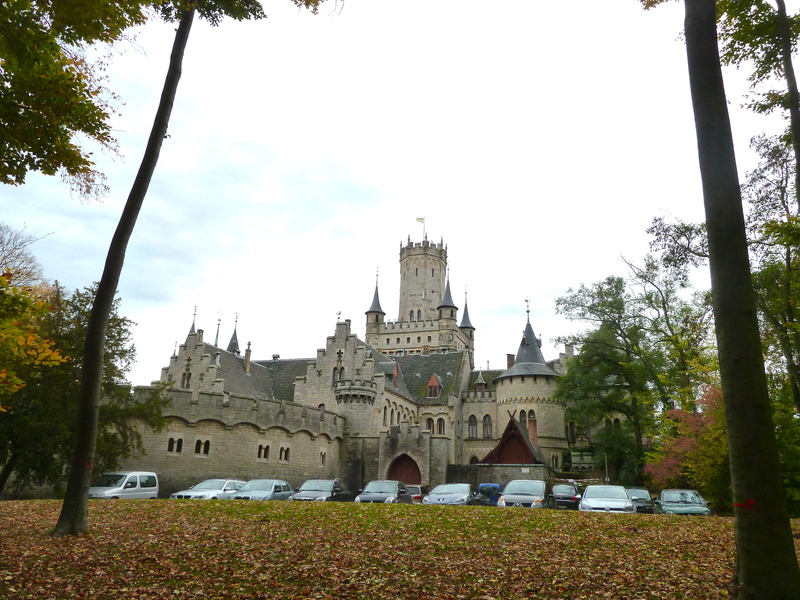 )- which lurks on the outskirts of Hannover. Happy Monday!